The warning lamps in the instrument panel of all ford vehicles are indicated on the display. 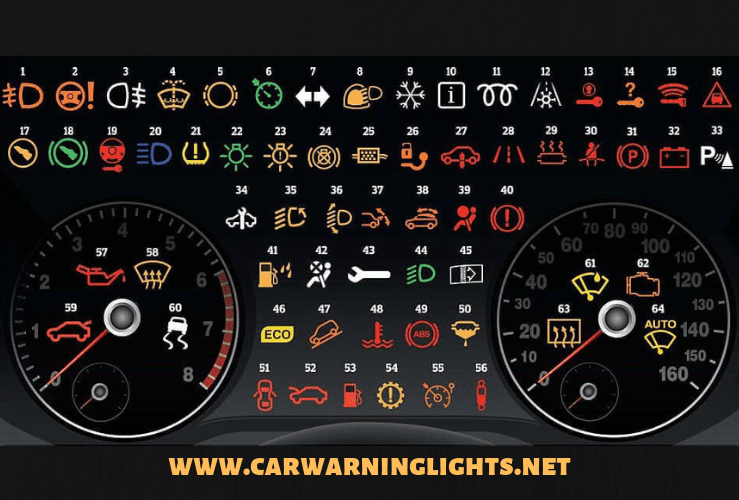 You can find the fault in your vehicle according to the numbers in the image below. The warning light that comes on the display when your front fog lights remain on. It means the warning of a fault in your hydraulic brake system. It means that the rear fog lights remain on. It means that the glass water or liquid is low. It means that your brake pads are worn and are about to complete their life. It means that the cruise control system is active. The warning warning lights are on when you signal. Indicates that there are problems in the lighting system. Means that your car goes into winter mode. Means that there is a variety of information about the car and must be read. Means that the spark plugs of diesel vehicles are active. Indicates an icy ground or icy weather. Indicates a fault in the start system of your car. It means that the switch is not far away in the car. The control means that your battery is low. Means that the tracking distance must be set. It means that the brake pedal is locked. A warning about the clutch system. This warning light may also come on when the clutch is depressed halfway. means that the steering system is locked. Indicates that the main beam is on. Shows that your tires are at a low level. Dipped beam headlamps may mean that the signals or stoplamps are active or malfunctioning. Indicates a problem with brake lights. It may mean that the particle filter for diesel cars is old or clogged. Indicates malfunctions in the filter system. It usually burns when it is clogged. There is a plug system for towing vehicles to the trailer for vehicles fitted with a trailer. This means that the connection is disconnected or defective. It is a malfunctioning fault in vehicles with air suspension. Turns to lane change states without signaling. Shows the faults in the catalyst system. Indicates the safety belt not fitted. The times when the parking brake is applied or when the automatic transmission is in park mode. Shows faults in battery and energy system. Parking sensors means switched on. There is a new generation of vehicles with automatic parking system. It means that a general fault or service must be taken. The headlamp may mean that the headlight is on or the main beam is active. Headlamp height adjustment indicates the required conditions. Illumination angles can also mean distorted. Indicates that your rear windbreak remains on or is defective. They are usually in sports cars. It is a warning light with a sunroof or convertible. The handbrake is on when it is towed. Light that indicates fuel is low. The airbag system is switched off. In some vehicles the airbags can be switched off. A mechanical problem or electrical system malfunction. Indicates that dipped beam headlights are on. Indicates that the air filter is dirty and needs to be replaced. Indicates that economic mode is active. Indicates that the hill holder system is active. Indicates cooling water problems or the car’s overheating. Abs shows the brake system malfunction. Indicates that the fuel filter may be contaminated or defective. Indicates that any of the doors are open. A warning light that indicates that the bonnet is open. Symbols the reduced fuel status. Available on vehicles with automatic transmission. There is a problem. On vehicles with speed limiter, the speed limit is exceeded. Symbolizes the problem of suspension system. Low oil level or pressure. Indicates that the windscreen is active when the ice dissipation is active. This light is on when the boot lid remains open. ESP (Electronic Stability Program) indicates that the system is off. Indicates that the rain sensor is active. This warning comes on when the vehicles with sensors are raining. This means check controll must be applied. The icon changes according to the brand and model. Means that there is a motor failure. The rear window means the defroster is active. The automatic windscreen wiper is active. Why Does The Oil Warning Light Came On? What Does the Oil Light Mean?